For those who are fans of the Fab Five Chef Mickey's at Disney's Contemporary Resort is a must-not-miss buffet. 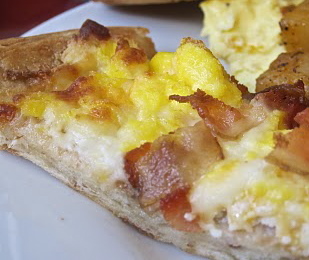 Chef Mickey's Breakfast Pizza is a fan favorite, especially with the kids. This recipe is very easy and quick to make. Perfect for getting the kids in the kitchen! Everything, except for putting the pizza in the oven, can be done by the kids so mom can sit back and relax... well, maybe for a minute. Preheat the oven to 375 F. Place the pizza crust on a baking sheet. In a medium bowl, blend the mozzarella, provolone, and cheddar cheese. In a small bowl, with a fork, beat together the eggs ad the heavy cream and season with the salt and pepper. Add to the cheese mixture. Immediately, to avoid clumping, transfer the cheese mixture to the pizza shell. Bake for 10 to 12 minutes, or until the cheese mixture is set and is beginning to brown.